Draw accurate comparisons between units of measurement with a unique height chart. Inches, centimeters, Unifix cubes, and hands are aligned and clearly marked so students gain a visual understanding of measurements in standard and nonstandard units. 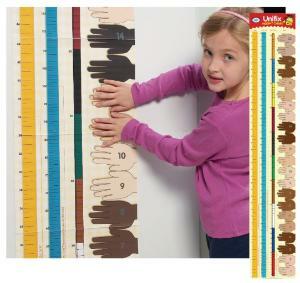 Designed for use with dry erase markers, this laminated chart builds skills in measurement, comparisons, and estimation. Size: 6'.